There are a lot of things that worry me about the new Lone Ranger movie. I dislike Depp as Tonto, I’m worried that Tonot is going to be the main character and the Ranger becomes the sidekick, and I’m very worried that the movie is going to be a live action Bugs Bunny cartoon like Pirates of the Caribbean. I take my Lone Ranger pretty seriously; I really don’t want it to involve him in tons of slapstick wackiness. What I am excited for is the Lego Lone Ranger. 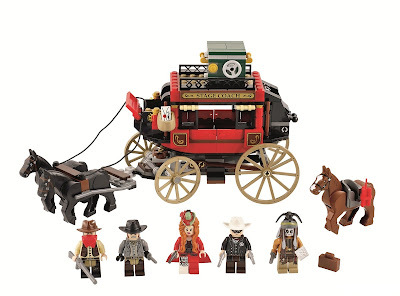 Lego has done Western themed sets in the past, but it has been a long time since any of them were on the shelves. Four or five years ago I was running the Western roleplaying game Deadlands. We used Lego for all the miniatures. I was all over Lego bit sellers and third party sites when putting together mini-figs for the party and their adversaries. The picture above is of the Deadland's characters. At the time I was just dying for more Western sets. It took a while but it finally happened. The real star of the lineup is the train set. But trains and tracks take up a lot of space. They set also costs about 100 dollars. What really excited me was a much cheaper set, the stagecoach. During that Deadlands game I was planning out what pieces I’d need for stagecoach, this one looks perfect. 30 bucks gets you the coach, an extra horse, and 5 mini-figures. I let myself get one Lego set a year. If I didn’t restrict myself I’d be broke and drowning in Lego bricks. So expect to see better pictures of this set in a month or two when I finally break down and buy it. I'm not usually into Legos, but that stagecoach is awesome!